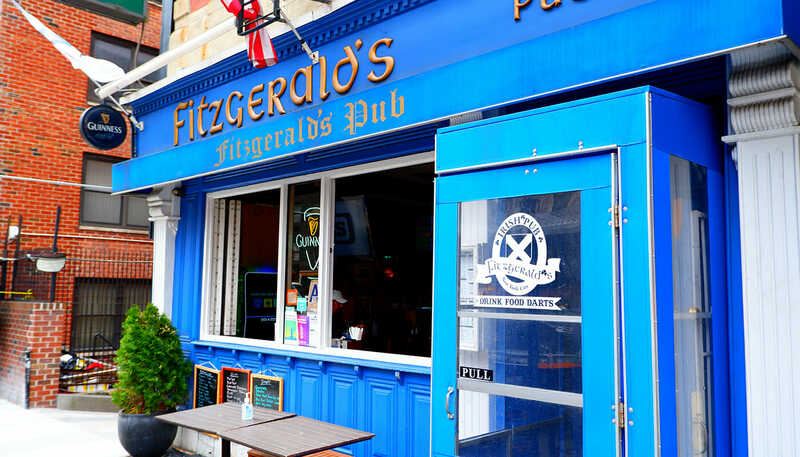 Irish Bars in New York are a great option if you are looking for a fun night out or just for a good pint between sightseeing. From a traditional shebeen full of history to a more modern venue. For watching the football, a quick pit stop or a great night out, New York does not disappoint. There are a number of traditional Irish Bars in New York, steeped in history and beloved by the locals. Some of the earliest unlicensed bars in the city are still trading today. Of course they are much more reputable (and legal) than they once were. Established in 1845 with a short break as a grocery store, Molly’s Shebeen is one of the original Irish Bars in New York. Located in East Village, with a traditional sawdust floor Molly’s serves a huge array of beverages. The cosy bar is also a good spot if you are looking for an Irish breakfast, a warming shepherd’s pie or corned beef hash, perfect sightseeing fuel! 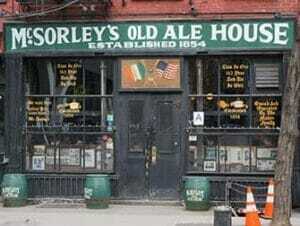 Another old school Irish bar steeped in tradition is McSorley’s. This no frills cosy bar is over 100 years old and serves one thing; its own Ale! Grab a pint and stand in the sawdust to experience the roots of Irish history in New York City. If you are looking for a place to watch the football or rugby, you can’t really go wrong with an Irish bar! Here are a few places that welcome fans from all over the world to pull up a seat, order a pint and settle in for the game! This East Village local specialises in European Rugby and Football, showing every game live. They are even home to the Liverpool FC Supporters Club of NYC! The Grafton have an all day menu serving traditional pub food along with some Irish specialities like a full Irish breakfast and fish and chips. Close to the bright lights of Broadway and Times Square, The Irish Pub offers food, drink and sports. Screenings, include soccer and rugby. They also offer an extensive international drinks menu and food such as beef and Guinness stew and corned beef sandwiches. In the heart of East Village is a family owned and operated local neighbourhood pub at 3rd Avenue and East 25th Street. Head here for a pint and a game of darts or to watch the football. They also have a happy hour with reduced priced drinks on weekdays between 11:00 and 19:00. For more tips on watching sports in New York, take a look here. Eric’s Tip: If you are in New York during the St Patrick’s Day celebrations, no doubt you will be heading to an Irish bar for a green Guinness! Head to Murray Hill on the east side of Manhattan. There are many Irish and British bars and lots of Indian restaurants all within a short walk! This lively haunt on the east side of the city is famous for showcasing live music 7 days a week! Named after a beloved Irish folk singer and with authentic decor from the Emerald Isle, head to this casual bar for a fun night out. They offer a Happy Hour with reduced priced drinks from 11:00 to 19:00, all week. Close to Times Square, in the heart of Midtown, you can find O’Brians. This Irish bar offers live entertainment throughout the week, including karaoke, live music and DJ’s: check their website for schedules. It is also possible to make a reservation here, so head over for a bite and stay for the entertainment!